Search for all "ARPC2 / ARC34"
Goat anti Bovine, Canine, Hamster, Human, Monkey, Mouse, Rabbit, Rat ARPC2 / ARC34. Product is tested for Enzyme Immunoassay, Paraffin Sections, Western blot / Immunoblot. Synthetic peptide from the C Terminus of Human ARPC2. 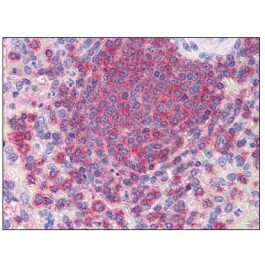 Immunohistochemistry on Paraffin Sections: 3.75 µg/ml. Western Blot: 0.1 - 0.5 µg/ml. ARPC2 is one of seven subunits of the human Arp2/3 protein complex. The Arp2/3 protein complex has been implicated in the control of actin polymerization in cells and has been conserved through evolution. 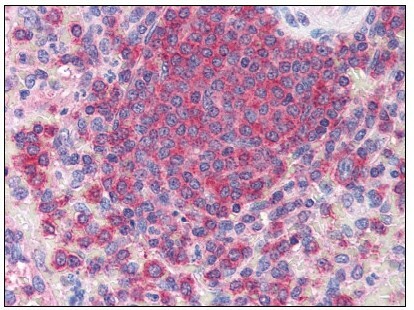 The exact role of ARPC2, the p34 subunit, has yet to be determined. Two alternatively spliced variants have been characterized to date. Additional alternatively spliced variants have been described but their full length nature has not been determined. This antibody is expected to recognize both reported isoforms of ARPC2 as represented by NP_005722 and NP_690601 at aa 288-300.